Someone asked awhile back what I thought of the Key Deer situation. 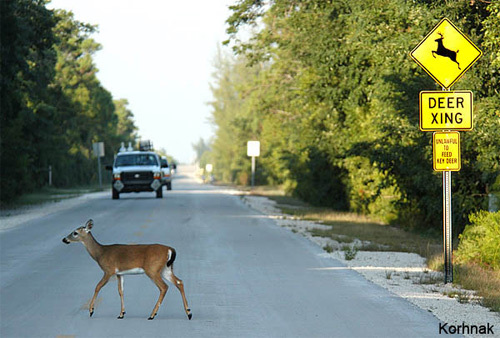 The size of dogs, key deer have lived in the southern Keys since the whole area was attached to the mainland. They were hunted into near-extinction in the 1940s, and are today they’re on the endangered species list, and have a sanctuary in the southern keys, where development is highly limited, and fences block access to their habitat. That rubs some locals the wrong way, and some have taken it out on the defenseless animals killing them, often in grievous ways. So, I’ll tell you: I think anyone who willfully harms one of these creatures should be sentenced to a slow and painful death. At the same time, if the government passed laws that infringe on property owner’s rights (and this applies to many more situations then just this one), I think they should be made whole — compensated for the difference between the land’s previous value and the land’s subsequent value. Bought your land after the laws were passed? Tough luck. But if you bought land, and subsequent laws make it impossible to do what you wanted to do with it? Well, that smells like a form of eminent domain to me, and I think the law should treat it as such. BTW, I passed through the deer’s territory on the recent trip, but didn’t get a chance to hang out with them. Apparently they’re very friendly, and will come right up to you and eat out of your hand. Awwwww. Image: Larry Korhnak/University of Florida. What’s the damn fleabag doing in the left lane?? did you take this pic? It’s awesome. Nope; stolen from the internets. sorry for the confusion. don’t know how anyone could harm these creatures . . . great post. Illegal to feed – so watch out for the FWC! Cute as bunnies, and they’re damn good eatin’, too. Seeing a Key Deer like that in broad daylight is rare. You can usually see them at night when cruising the lower keys. They are beautiful however I’m given to understand that they are also in danger because the populations became so low that there’s a lot of inbreeding and not enough genetic variation. I suppose some scientists are looking at this and perhaps introducing deer from the mainland can help. Also I know that in several areas they have built tunnels under the road so that the deer can freely pass from one side to the other without getting hit by cars (which is the reason most of them die).